Ema Peter/courtesy of Michael Green Architecture Got wood? 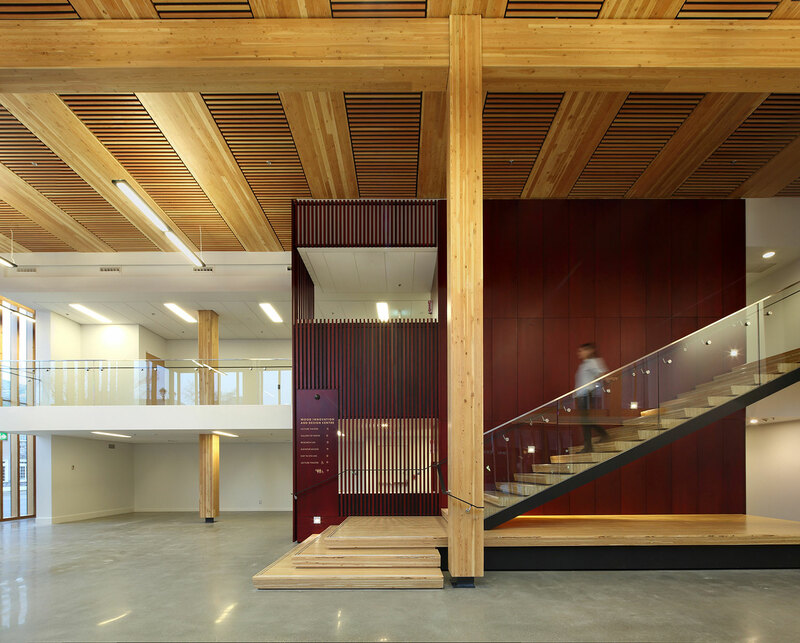 At 29.5 metres, WIDC, in Prince George, BC, is the tallest mass-timber building in North America. Michael Green likes to think big, talk big, and build tall. He schmoozes with government power brokers, innovative engineers, and audacious developers. In his Vancouver studio on a silver-skied January morning, though, the crowd is considerably more ingenuous: a class of high school students ferried in from the Sunshine Coast. “Once in a while, we say, Let’s just dream up some crazy idea, like building an art gallery underneath Stanley Park,” he tells the spellbound teenagers, illustrating the concept with a rendering of a subterranean gallery shaped like a starfish. “The what-ifs are an important part of being an architect.” Then he segues into the biggest what-ifs of his career, the ones that have brought him international attention. What if we were to start building our cities with a strong, fire-resistant, renewable resource? What if that resource were wood? What if British Columbia could lead the way? A posse of Vancouver architects, engineers, manufacturers, and consultants are doing just that by working with wood that can be carved like stone and cantilevered like I-beams. Their designs are reaching heights and widths unfathomable even five years ago, and they are leading a paradigm shift in construction. It’s not just that they’re building with new, stronger boards; they may well also have found an eco-friendly replacement for concrete and steel. Engineered wood—so-called mass timber—is not entirely new. Glued laminated timber, or glulam, comprises multiple layers bonded together, and can be found in nineteenth-century British churches and fifty-year-old American bridges. But today’s glulam is manufactured with computer technology at increasingly high levels of sophistication, part of an alphabet soup of innovative products: cross-laminated timber (CLT), laminated veneer lumber (LVL), laminated strand lumber (LSL), parallel strand lumber (PSL), and nail-laminated timber (NLT). CLT, for example, is a kind of jumbo plywood that was invented in Switzerland in the 1990s. It has become steadily more popular in Europe over the past ten years but until recently hasn’t been available in North America. When Vancouver architect Greg Dowling designed his family home a few years ago—the first CLT-built house on the continent—he had to import the panels from Austria. Four years ago, Nordic Engineered Wood and Structurlam Products began manufacturing the product in Montreal and Penticton, BC, respectively; they are still the only two certified construction-grade suppliers in North America. Today’s CLT panels can be thirty centimetres thick and eighteen metres long; when used in tandem with contemporary glulam beams and other wood products, mass-timber frameworks approach the load-bearing strength of old-growth timber, concrete, and steel. In Japan, rigorous seismic testing that replicates the effects of the 1995 Kobe earthquake has shown them to be as strong and resilient as those made of more conventional materials. And their large, thick components are much more fire-resistant than traditional two-by-fours, which have greater surface areas to feed the flames. Light a fire under a glulam beam or a CLT panel, and it would take hours to ignite. By then, the fire department would long since have arrived. Ema Peter/courtesy of Michael Green Architecture Cabin in disguise Drywall panels clad WIDC’s contemporary CLT structure and enhance fire-resistance. Vancouver firms are using the latest mass-timber technologies to design brilliant spaces. Their buildings—such as the new Fort McMurray International Airport terminal, by Office of McFarlane Biggar; the University of British Columbia’s Bioenergy Research and Demonstration Facility, by McFarland Marceau; and the Centre for Interactive Research on Sustainability, by Perkins + Will—have won acclaim for their technical and pragmatic elements, and as welcome antidotes to the austere glass, steel, and concrete palette of contemporary modernism. 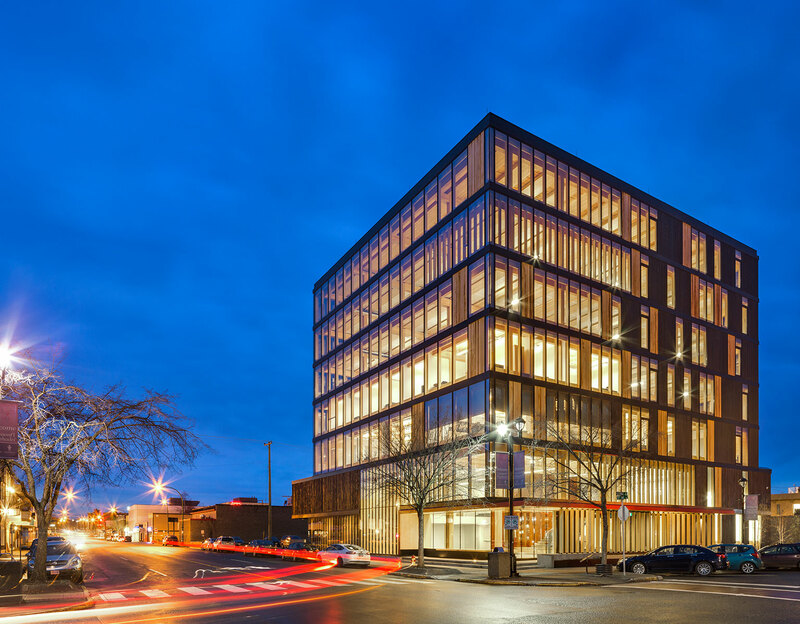 While the UBC project trudges through the approval process, the University of Northern British Columbia, in Prince George, lays claim to the tallest mass-timber building in the Western hemisphere. Designed by Green, the Wood Innovation and Design Centre rises 29.5 metres. Although it contains just six floors, its frame is nonetheless taller—by twenty-eight centimetres—than a nine-storey structure in London that once held tallest-timber bragging rights. Green strategically placed a double-height main level and mechanical penthouse, but technically adhered to current Canadian building codes, which limit wood-frame construction to six storeys. From the street, WIDC (pronounced “widdick”) projects a strong dose of urban cool, with its distinctive (for Prince George) height and glass-clad slickness. As you move closer, you notice massive supporting columns just inside the glazed facade. That’s the idea: the framework is on the inside, protected from the elements. Even deeper inside is a truly immersive experience, with wood above, below, and beside you. It speaks to a West Coast sensibility: it’s hard to imagine this building in, say, New York or Toronto. 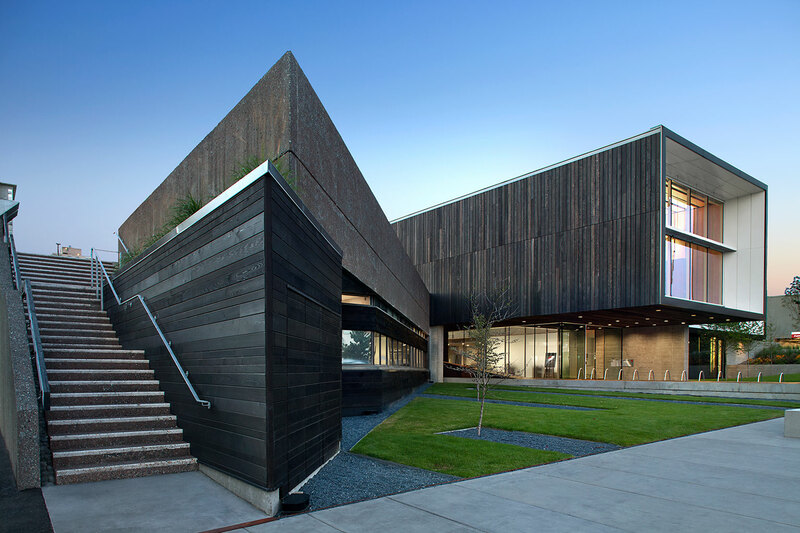 Some of the detailing is uneven compared to that of Green’s other finely wrought mass-timber works, such as North Vancouver City Hall and Ronald McDonald House BC. Perhaps one should expect such hiccups in a pilot project, especially as Green wasn’t on site when WIDC went up. On the other hand, we can take this building as a useful proviso for the entire industry. If North America is going to shift to mass timber en masse, every player in the development chain will need to get up to speed with European construction standards—which, at the moment, are considerably higher. Special fasteners, for example, still have to be imported from Austria and Germany. The North American industry will have to retool if it wants to keep pace with its counterparts across the Atlantic. It was Wimmers who in 2007 helped introduce Green, along with his then partner Steve McFarlane and engineers Eric Karsh and Robert Malczyk, to mass timber, by leading them on an eye-opening tour of contemporary buildings in Innsbruck, Austria, before they attended a conference 200 kilometres away in Bregenz. The four Canadians left Europe determined to bring the idea of mass timber back home; Wimmers travelled to Canada to oversee the passive-house project and never left. In the wake of the Canadian design competition, the United States Department of Agriculture launched one of its own—and enlisted BC expertise to help create and manage the process. Vancouver-based Cees de Jager, general manager of the Binational Softwood Lumber Council, helped coordinate the competition here and is doing the same with its American iteration. Kelowna-based expert Oscar Faoro is the project manager. Why enlist Canadians? “You go where the talent is,” de Jager says, cheekily. Ema Peter/courtesy of Michael Green ArchitecturePuzzle pieces Innovative LSL panels form a sixty-seven-metre-long atrium at North Vancouver City Hall. Green is moving on now, planning a mass-timber high-rise in Paris and a seven-storey office and retail complex in Minneapolis, for Houston-based Hines Interests. The latter building is the kind of project that would be a prime candidate for the USDA competition, and Green is a dual citizen. It would be a sweet irony if a Buy America project turned out to be designed by a Vancouver architect. 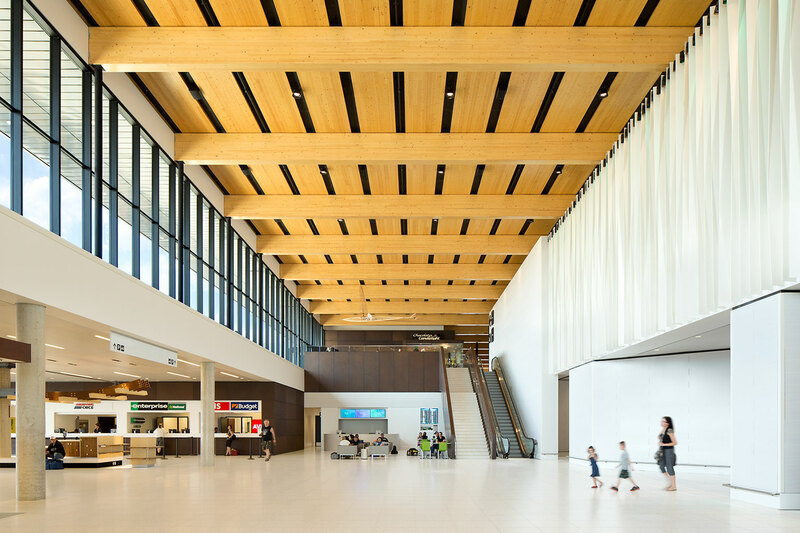 Ema Peter/courtesy of Office of McFarlane Biggar High-flying The Fort McMurray airport boasts one of the largest laminated-wood ceilings in the world. This appeared in the May 2015 issue.